Sometimes, I get tired of talking about food and then I'm really glad I'm not strictly a food-writer or chef. You know my personality (or at least most of you have a good idea) and the numbers prove that you would usually rather see that and read about me than see just food and read only about that. Interesting, huh? I'm still working on my talk-about-myself skills, though. Fun fact: I still wait until absolutely necessary and/or explicitly asked about my blog to tell people it exists. Why I have such shyness about it, I do not know. Guess what I did yesterday. And the yesterday of last week. I RAN. Mmmmmmhm - a whole 3.5 miles on the treadmill both days. You could not have paid me to stop smiling all day. I stepped on the treadmill for the first time in I-can't-even-remember-how-long, took a deep breath, and mentally and physically prepared myself for either a fantastic workout or a slight disappointment. Thankfully, I did not get the latter and got a big smile for the 32 minutes I spent running. Oh, and muscles more sore than ever for the following 48 hours, but that's a minor detail. Justin Timberlake sang to me the whole time, too, so there's that. I wish I could find the words to explain running. Yeah, it's exhausting. It's sweaty. It's muscle-aching. It's heavy breathing. It's mentally and physically challenging. Yet, it's kind of addicting... in the best way I've ever known possible. My chest pulls in oxygen with every inhale and my legs push higher and farther and faster. My cheeks heat up while my skin lets sweat help cool it down and my mind encourages every muscle to just keep going. My lips form a grin as my hands prop the rest of upper body up on my knees (which don't hurt!!!!) and my entire body just kind of says "... yeah. you go girl." It's kind of like that, I guess. And then, sadly, I must get off the treadmill and unlace my shoes for the day. I'm still taking it easy to hopefully prevent any sort of discomfort or pain. My knees are forever fragile, so running is a treasure I treat with utmost care - nothing to mess around with or take advantage of. One of my favorite parts about running, which you'll either find extremely odd or extremely relatable, is the soreness that follows during the next 48 hours. I tell people that it feels like the muscles in between other muscles that feel it most. Whether that's right or wrong, I do not know - all I know is laughter hurts, and then I end up laughing more when I remember that it only hurts because I ran, and that brings me child-like joy. What made you happy this week? What forms of movement did you enjoy? Tell me in the comments below! Melt the first three ingredients in a double-boiler over low heat until smooth, about 8-10 minutes. Stir continuously to prevent burning. Remove from heat when smooth. Line a square or rectangular glass dish with parchment paper. 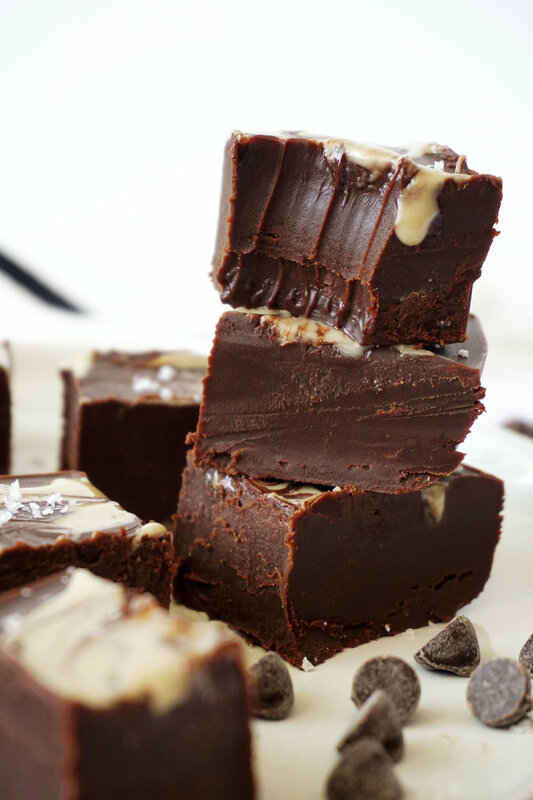 The size will vary depending on how thick you want the fudge - larger dish = thinner fudge, while a smaller dish = thicker fudge. Pour the melted ingredients into the dish and use a rubber spatula to smooth into an even layer. Refrigerate 30 minutes to cool and begin the solidifying process. 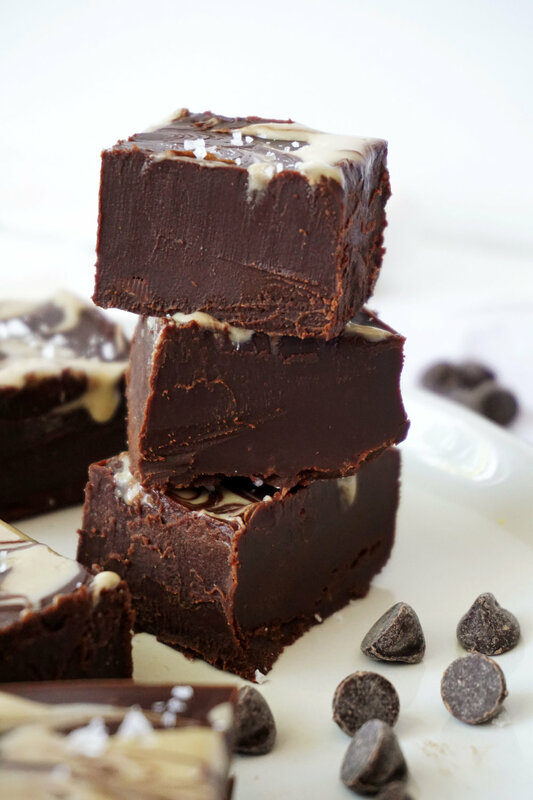 Carefully drop small spoonfuls of the tahini on top of the cooled fudge and use a toothpick to drag the tahini around the surface to create swirls. Repeat with the remaining tahini, then sprinkle lightly with sea salt. Refrigerate again until completely firm, about 2-3 hours. Then, slice into small squares using a sharp knife. Serve within 30 minutes if not storing in a cool location. Keep leftovers in an airtight container in the fridge or freezer.